The contemporary public domain, as a ‘free’ space where culture is produced and exchanged, is shrinking ever further owing to pressure from various developments. 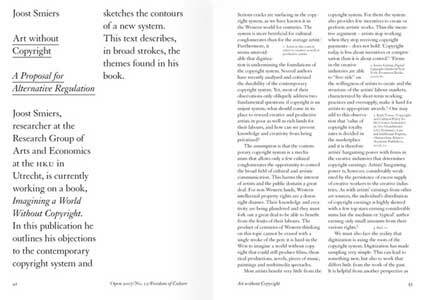 While the exchange, distribution and appropriation of cultural products (‘content’ in the form of music, images and texts) is actually becoming easier in digital society, there is also a move towards greater regulation and control, particularly in the guise of new copyright laws and policy concerning ‘intellectual property’. Instead of a ‘free culture’, the contours of a ‘permission culture’ (Lawrence Lessig) are emerging. Simultaneously, as an aspect of broader privatization and regulation processes, there seems to be a shift towards private entities (wealthy patrons, corporate sponsors, etc.) being able to appropriate more and more of the public domain’s component parts: public culture then falls into the hands of private individuals and businesses, and these entities decide what is made available or publicly accessible. 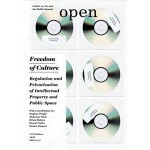 This issue of Open investigates the root cause of these developments, how they interrelate and what the implications are for the ‘free’ production and practise of culture, as well as for the internal dynamics and balance of power in the public domain.